Another main course, this time it requires a little more dexterity and is time consuming, but the result is delicious. 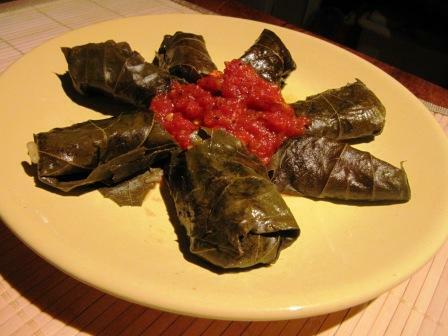 Stuffed vine leaves leaves are common meal in south-east Europe and the Middle East and are easily adapted for vegans. Here’s my interpretation. Cut the aubergine in small cubicles, about 0.5 cm, salt them and put away for 10 minutes. Grape the carrots and chop the onion. Heat the oil in a pot, add the spices and then the onions. Stir and add the aubergines and the carrots. Stir again and leave for 2 minutes. Put in the rice, stir, add 1.5 the volume of the rice in water and cook until the liquid is absorbed. 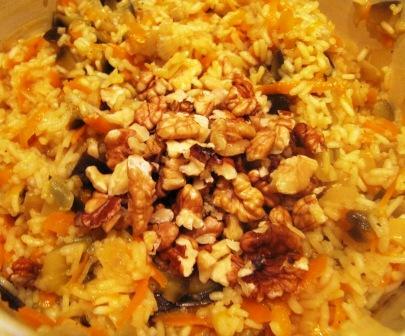 Now add the walnuts and mix well. 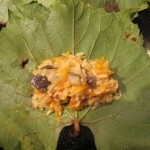 Choose a couple leaves to cover the bottom of the pan and to put the folded vine leaves on. 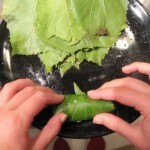 Use a spoon to put some of the filling on the inner side of the leaf, shape it as a cylinder with your fingers, fold over the back, them the sides and roll (see pics). Put 2-3 leaves on the bottom of the pot. 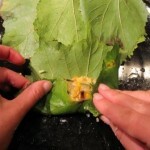 Use a spoon to put some of the filling on the inner side of the leaf. Fold the back of the leaf on top. Fold over the left and the right sides. Pres slightly with your fingers. Now use your fingers to roll the little cylinder. 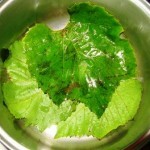 Put in the pot with the other vine leaves. 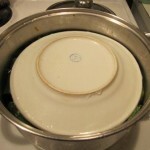 Cover with a plate to avoid unfolding white boiling. 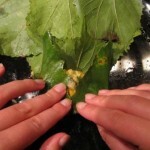 Useful tips: don’t use too much filling per leaf – it won’t fold properly. 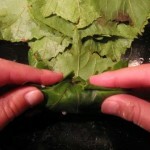 Also – pack the folded leaves tightly in the pot in two layers. If there are some you couldn’t place in the layers, put them in the middle. 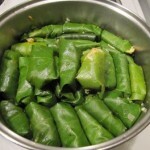 Pour in some water – to cover well the stuffed vine leaves and put a dish to snuggle them and to prevent them from unfolding while boiling. When the water level drops below it’s ready. Crush the garlic with a knife and chop it. Heat the oil in a pan and fry the garlic for 30 seconds with the grounded black pepper and paprika. Stir and add the tomatoes. Lower the heat and leave for 10 minutes. Sprinkle with the basil and cook for another 10 minutes. 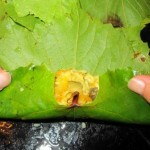 Serve the stuffed vine leaves with the sauce. 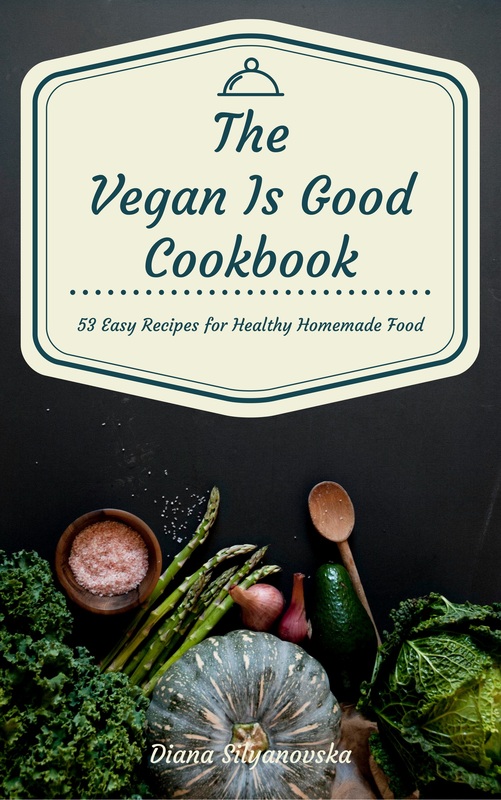 Goes well with some Merlot.